No need to hibernate. Hit the trails year-round with this expert advice. If the polar vortex has brought anything (besides cold weather, that is) it’s cabin fever. Spring feels further away than ever for large swaths of the country—but that doesn’t have to mean the outdoors are off limits. Hiking in the winter has its own rewards, including crowd-free trails, snowy scenery and fresh air. 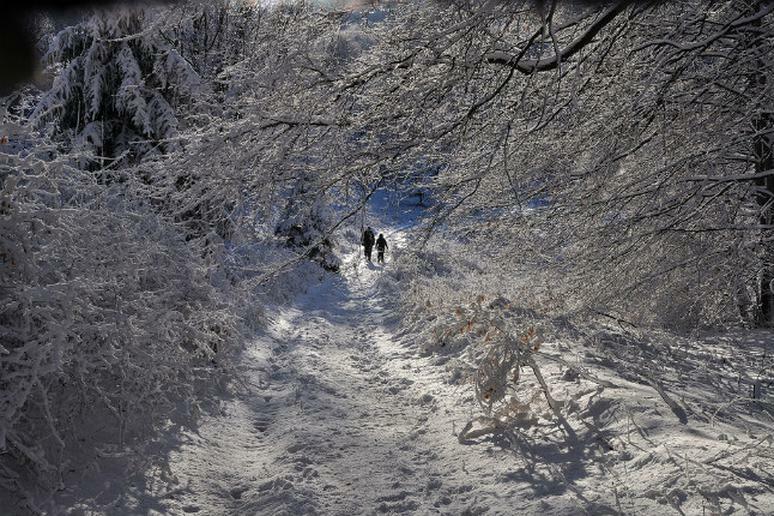 We reached out to Bruce Matthews, executive director for the North Country Trail Association, for advice on getting outside during the cold months. A former licensed Adirondack Guide and past Director of the S.U.N.Y Cortland Adirondack Winter Studies program, Matthews shared tips via email on planning your outing, staying safe and getting the most out of your winter hike. Plenty of blankets, a good shovel, bag of sand and salt, tow rope/strap, tire chains, plenty of road flares (check expiration) which can also be used as fire starters, tarp/plastic sheet/old shower curtain (to lay on when attaching tow rope, changing tire, etc. ), snacks and water. And, of course, while a good forecast is no guarantee of perfect conditions for driving or hiking, a bad one is a sign you should stay home. Because you’re less likely to encounter other hikers in the winter, it’s even more important that you leave a plan with someone. Tell a friend or family member where you’re going and when you expect to be back home. In cold weather, an injury can mean more than hobbling back to the trailhead on a sprained ankle: it can mean hypothermia, which can lead to death. Having company is also insurance against getting stranded alone in the woods if you (or your ankle) get turned around. “I’m a fan of gaiters,” he added. Gaiters are a protective garment worn over the top of your boots and your lower pant leg to keep mud and moisture out. Also, prepare to get wet: pac boots and wool socks will help keep the snow out and your feet toasty. And, lest it need to be said: “Stay off ice-covered rivers and streams,” adds Matthews. Even a single soggy foot can ruin your day. A word of warning: “Save the alcohol for when you're back safe in your cabin.” Too many nips from the ol’ flask can increase your risk of frostbite. Matthews also recommends carrying an emergency bivy sack. This one applies if you’re hiking in the mountains. Learn the basics of avalanche safety, know how to avoid risks and what to bring: beacon, shovel and probe are a must. An airbag might help save you in a slide, but best not to find yourself in one in the first place.